Before Veronica became ill, she and her husband were working; she worked buying and selling maize on the road and he was a part-time mason on the construction sites in Usa. This all changed when Veronica and her husband became ill. While Veronica has looked for help and works tirelessly to keep her many dependents fed, her husband stays at home and finds it very difficult to cope and contributes little to the household. Veronica lives in Usa River, with her husband, their six children and her grandmother (her father’s mother). Her grandmother recently broke her hip which has been pinned – her leg and knee, as a consequence, are often painful. Veronica’s parents live in Singida and also need whatever money Veronica can send to them. After Veronica became ill she was not sure how she was going to manage. She had the 6 children to feed, as well as her husband and herself, she had to pay the rent and support her relatives in Singida. Finding enough food alone was difficult not to mention the money to cover the cost of all the many requirements of schooling: uniforms, clothes, shoes and books. 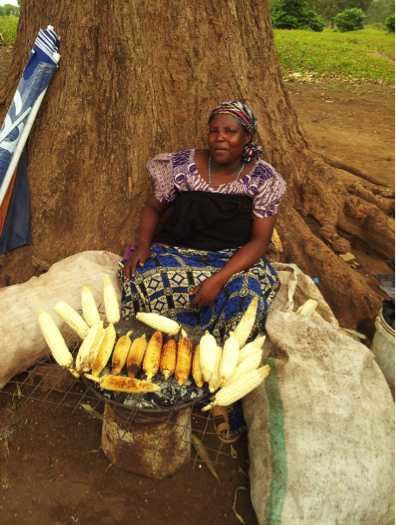 Without savings she found her maize business unprofitable since she had to ‘borrow’ the maize cobs from the farmer on a post pay basis – no fixed price was arranged beforehand so her takings could vary. She had heard of Mondo through friends and decided to approach James Ruby, the Area Co-ordinator who is well known in the area. She asked him what help he could provide and they talked about her business. She asked if she could join in the grant and loan scheme. Veronica went through the training Mondo provided, learning how to attract customers, calculate profits and organise savings. Then she was ready to start. With the money from the 200,000 shilling grant she bought a big umbrella, a supply of maize, and a large jiko (charcoal fire). Veronica’s daughter Margaret supports her and takes on the work running the business when Veronica is unwell. Margaret and her brother Timotho are often out helping Veronica, travelling to the fields to buy the fresh corn cobs in the morning and bringing them back, either by kokoteni (wheelbarrow) or on a piki piki (motorbike taxi) for Veronica to roast and sell. Work for Veronica starts early in the morning. Margaret, Timotho or Veronica need to be early to buy the maize as the competition for this kind of business is fierce. With the grant money she has noticed a difference; she usually finds fresh corn every day whereas before she had great difficulty getting fresh cobs. In her own words (via translation) her business gives her a better life, and more money. She meets a lot of different people, she’s outside – it all helps to reduce stress. She no longer dwells on her problems, when she comes home she is tired and sleeps well. She now makes enough profit to cook a good meal at the end of each day for her family. She says that she leaves stress at home and goes out and meets people and so has become a happier person. If you would like to help support more women like Veronica, we are currently raising funds for our next round of grants and loans. To help us achieve our target you can donate here.